August and Nest/Yale employ low-energy home-automation protocols (Bluetooth LE and Thread/Weave) for their door locks, connecting to the home network via Wi-Fi-enabled video doorbells powered over wire. 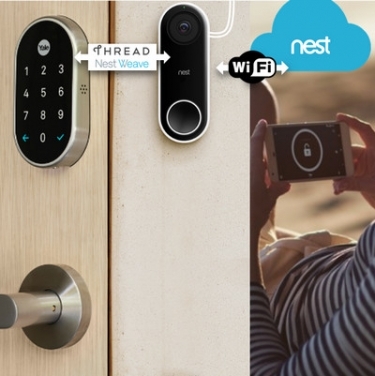 Nest x Yale smart locks communicate two-way with the new Nest Hello wired video doorbell via Thread and Nest Weave home-automation protocols. The doorbell serves as a Wi-Fi gateway to connect the lock to the Internet and the rest of the smart-home ecosystem. August's lock/doorbell combo operates similarly, except using Bluetooth instead of Thread/Weave. When it comes to front-door security, there's no better one-two punch than a smart lock and video doorbell, both connected to the Internet for access control and remote viewing. The challenge for wireless door locks is that Wi-Fi, which is required for network connectivity, can drain a lock's battery pretty fast. Besides, Wi-Fi is overkill for a device that needs to share only small bits of data. On the other hand, Wi-Fi makes perfect sense for video doorbells, as long as they are wired for power. These devices need all that energy for HD video and two-way audio, and they're positioned at the doorway for easy access to indoor power -- whether from the home's existing doorbell wires or a new connection to an AC outlet. Given their close proximity, why not use a wired doorbell as the Internet gateway for a battery-operated door lock? That's exactly how August Home (now owned by Assa Abloy) and Nest designed their front-door duos. August locks communicate via Bluetooth; Nest x Yale locks employ Thread networking technology and Nest's own Weave home-automation protocol. Both locks consume very little power in their two-way communications -- that's the good news. The bad news is they require a Wi-Fi gateway device to connect to the Internet and to other devices in the smart-home ecosystem. In both cases, August and Nest doorbells can serve as the gateways for their respective locks. Otherwise, users require a standalone Wi-Fi bridge -- the August Connect ($79) or Nest Connect ($69). In Nest's case, the Weave-enabled locks also could access the network via Nest Guard, the hub of the new Nest Secure alarm system. In fact, most Nest devices from the first thermostat to every surveillance camera, support Thread/Weave and Wi-Fi, so (theoretically) they could serve as the IoT gateway for a Nest x Yale lock. Same goes for Z-Wave door locks, which connect to the network via Z-Wave-enabled home-automation systems; however, you won't see Z-Wave-enabled video doorbells or cameras taking on that role for consumers who just want front-door security and a simple app to control it all.